Frequently encountered when trawling the Internet looking for information on Chinese cloisonné ateliers such as DeCheng and Lao TianLi are statements about awards won at the international exhibitions held in 1904 in St. Louis and 1915 in San Francisco; but, pictures of the actual pieces and their award medals and certificates seem impossible to find. However, thanks to digital publishing, historic records of these exhibitions can be searched to produce interesting bits of information about who exhibited and what they exhibited, and how prizes were awarded. China: Catalogue of the Collection of Chinese Exhibits at the Louisiana Purchase Exposition, St.Louis 1904 is one such resource. It is available in an Internet Archive digital edition that is wonderfully easy to use; the pages can be turned as if reading a book, or by using the slide bar at the bottom, or searched via key words (I simply used the word “cloisonné” in the search box). It contains much other fascinating information about Chinese culture circa 1900 besides cloisonné, but we’ll stick to the subject here. Pages 54-56 [use the slide bar] list the “Modern Cloisonnes” that were exhibited – an astonishing variety of objects from vases to umbrella handles. Pages 56-57 contain a description of the process of cloisonné manufacture. I found it interesting to contrast the techniques with those used in contemporary cloisonné factories and workshops, and to note that gilding with electroplating (“an ordinary galvanic process”) was in use instead of - or perhaps as well as -mercury gilding. "The manufacture of cloisonne at Peking has revived during the past thirty years, and the Peking Industrial Institute is paying special attention to this art, which it hopes to bring up to the standards of the old enamels of the Ming dynasty and the period of the Emperor Ch'ien Lung." 6. “Kien Lung" Cloisonné Vase. 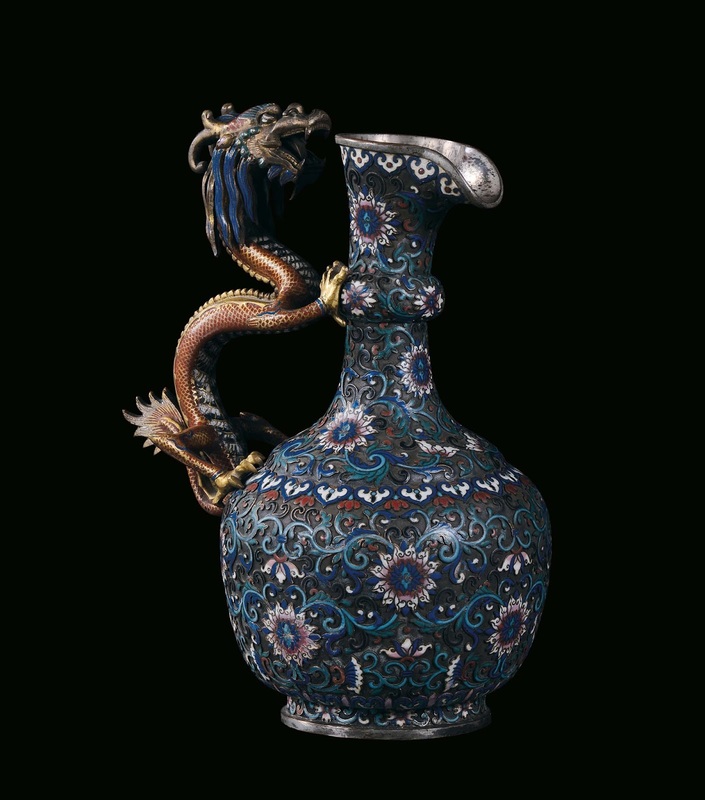 This perfect specimen of the best Chinese Cloisonné of the “Tsing” Dynasty, 1736-1795, was among the treasures of the “Yuan Ming Yuan” or Summer Palace in the early sixties. The shape is very original, and all the coloring most harmonious. 7. Cloisonné Plate. This specimen is in absolute contrast. 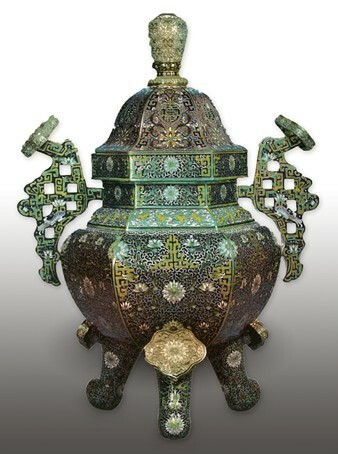 It is in the newest type of raised cloisonné, executed by the well known firm of Te Cheng at Peking. Readers might want to compare this plate with this one that features a DeCheng stamp and paper label. Is the lighter rectangle on the brass base evidence of a similar former label? Observe how the lack of backqround enamel creates the appearance of champleve. Pages 333-334 list a variety of cloisonné objects “Exhibited by Kwong Cheong Tai – Canton, Original Objects of Art Workmanship,” followed by a few mentions of cloisonné table tops in furniture. Other cloisonne exhibitors are listed in various places (remember the keyword search function). The Story of the Exposition: Being the official history of the international celebration held at San Francisco in 1915 to commemorate the discovery of the Pacific Ocean and the construction of the Panama Canal, by Frank Morton Todd. Volume 1 at the Internet Archive features a photo of Chinese cloisonné in the Palace of Fine Arts on page 30, with accompanying text description of the Chinese exhibit starting on the previous page. Volume 3, page 287, chapter LIV, The Forbidden City, describes the Chinese effort at the exhibition. "Her entry into the Panama-Pacific International Exposition was the first official revelation of modern China to the modern world. At previous expositions the Chinese exhibits have been made under the direction of the Maritime Customs Administration, a bureau largely composed of foreign officials which generally collected the material in the treaty ports and took or sent it to the exhibit palaces. The year 1915 saw the manifestation of a different spirit, a decision to participate as a nation, on a basis of Chinese nationality. It was the first time China had so officially participated in any exhibition outside her own borders, and she showed in her pavilion and throughout the exhibit palaces a revolution in ideas and ideals – the tremendous intellectual turnover of a vast empire." The whole chapter is rather quaint reading. “The 56 models of pagodas,” for example, likely refers to the awesome Tushanwan Pagodas. The Tushanwan woodcarvers also made China’s ceremonial gate at the 1915 exhibit. Don’t miss clicking the link to read Adam Minter’s article, it’s a fascinating bit of history. Who exhibited? Starting on page 82, The Official Catalogue of the Palace of Fine Arts, Panama-PacificInternational Exposition, lists the cloisonne works in the Chinese section. An openwork ewer with DeCheng characters bottom stamp. The site featuring this ewer also cites a similar dragon ewer, no. 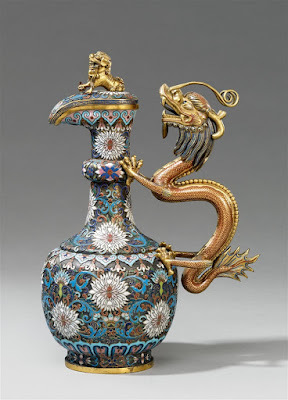 140, in Beatrice Quette's book, Cloisonne: Chinese enamels of the Yuan, Ming, and Qing Dynasties. 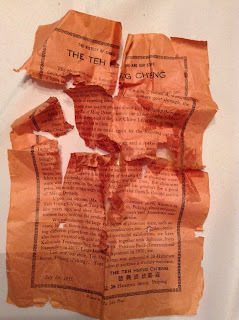 The flyer described in the post on DeXingCheng states that the Panama-Pacific International Exposition in 1915 was one of the exhibitions in which the firm was awarded gold and silver medals together with diplomas. I wondered why, in the Panama-Pacific list of exhibitors, awards are listed in italics under the names in many other categories - such as porcelain, lacquer, stone, and glass - but none in the cloisonné section? Volume 4, of Frank Morton Todd’s account, beginning on page369, Chapter LXIX, The High Court of the Arts describes the jury system for awarding the medals. "These juries were composed of men of renown; such authorities and masters of craft as … C. Y. Yen of China in the field of the Fine Arts;"
Mr. Yen appears in the group photo of the Superior Jury, the decision-making group for the awards. So the Chinese cloisonné medals from the 1915 San Francisco exhibition remain a bit of a puzzle. Susan’s Weber’s chapter in Beatrice Quette’s Cloisonné: Chinese enamels from the Yuan,Ming and Qing Dynasties is an impressively researched piece on how the great public exhibitions of the late 19th and early 20th centuries inspired collectors worldwide – wealthy connoisseurs, public museums, humble department store shoppers - to develop a taste for Chinese cloisonné. Weber’s selection of photos is superb. She covers not only collectors in Britain, France, and the United States, but Germany, Hungary, and Russia as well. It’s an awesome piece of documentation – 33 difficult-to-find pictures, 6 pages of bibliographic citations at the end. Above examples of original publications give some idea of the type of research swamp Weber had to wade through to assemble her article, providing yet another reason for anyone interested in Chinese cloisonné to rush out and get a copy of Quette’s book. A glimpse of what these exhibitions were like can be seen in the quaint stereoviews collected at The Hillman Stereo Archive. In 1904, Lee made ​​God "Baoding stove" won the first prize at the Chicago World's Fair in 1915 and re-award the Panama Pacific International Exposition. Heaven Lee facility is located Po Temple Street, foreign built, and more products for export, are printed on the base "God benefit system" Ming paragraph. The 1904 exposition was in St. Louis, not Chicago. The Qing government did not officially participate in the 1893 Chicago Columbian Exposition, although wealthy Chicago Chinese did organize exhibits. 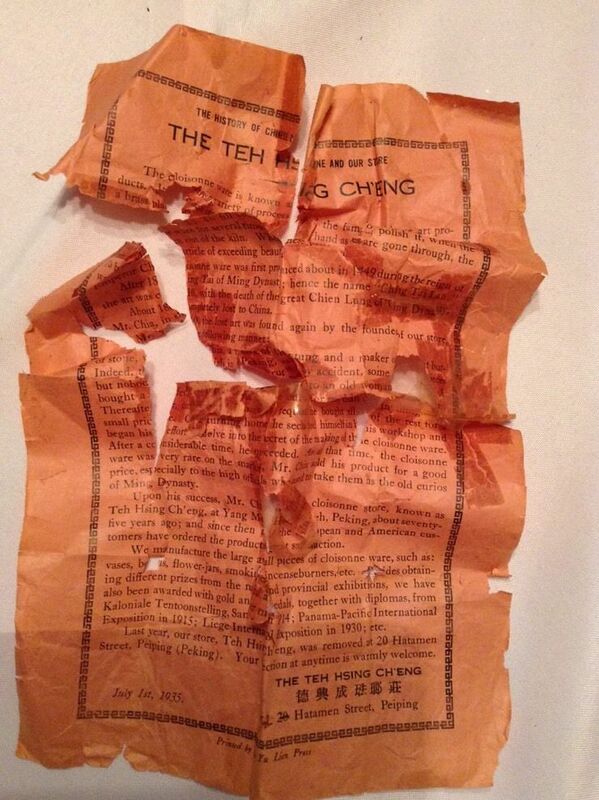 You can read some very interesting accounts of the Chicago fair at the Chinese-American Museum of Chicago website. The Chinese article in which it appears is about cloisonne artist Li Peiqing at a December 2012 charity event, and the photo caption states that it is a Lao TianLi work that won a gold medal at the "Panama World Expo" 100 years ago. 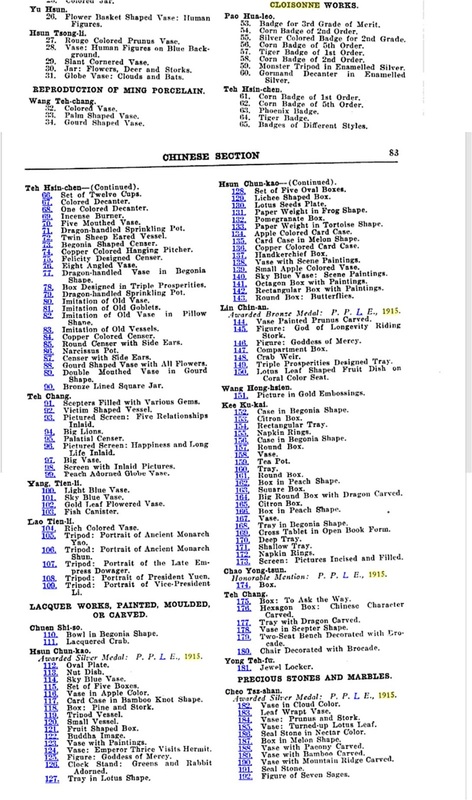 The listing for the 1915 San Francisco Panama-Pacific exhibition quoted above does not include an incense burner under the works by Lao TianLi, only "Rich Colored Vase" and what I am guessing are tripod portrait frames. What is the actual source for this photo? Is it a piece now held in the Palace Museum? Does anyone know?